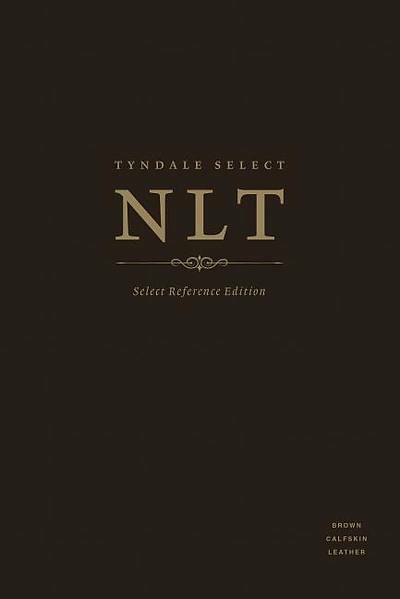 Tyndale Select Bibles are the highest quality bindings available in the New Living Translation. Select Reference Editions are the premier Bibles in the Tyndale Select line. Select Reference Editions deliver God's enduring word in a fresh, yet timeless, reading experience. Each full-grain leather Bible is meticulously handcrafted with excellence, and Smyth-sewn with the greatest of care to ensure durability, flexibility, and a lay-flat binding. Handsome editions are available in black or brown full-grain calfskin leather. Calfskin leather covers are handbound and a pleasure to hold. Calfskin leather editions feature superior gold-gilded page edges and two ribbon markers. The attractive single-column interior of the Select Reference Edition makes this Bible enjoyable to read. The line-over-line setting and top-quality paper maximizes the brightness of the page and minimizes show-through for optimal readability. Other premium interior features include the generous 8.75 font, spacious margins, and over 40,000 cross references. Printed, bound, and meticulously handcrafted at Jongbloed's premier bindery in the Netherlands, Select Reference Editions are Tyndale's finest-quality Bibles available in the New Living Translation.